Tickets are available at the door or by calling (973)980-1809. Parking is free in the adjacent lot, and Livingston High School is wheel chair accessible. 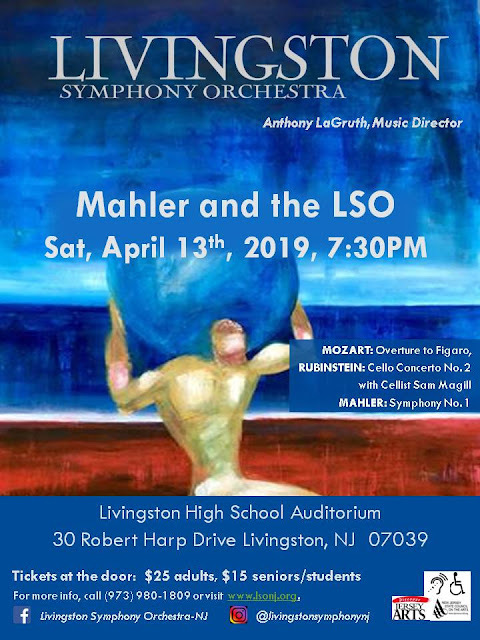 The Livingston Symphony Orchestra is looking forward to presenting their upcoming concert. The performance opens with Mozart’s frenetic Overture to “The Marriage of Figaro,” followed by Anton Rubenstein’s melodic “Cello Concerto No. 2” featuring soloist Sam Magill of the Metropolitan Opera Orchestra. The program closes with Mahler’s monumental 1st Symphony. Unlike the overture for most operas which introduces the musical themes to come, “The Marriage of Figaro Overture is nonstop and aimed at setting a tone. The music in this overture is suggestive of the onstage antics to come, which include whispering, impersonation, cross dressing, darting between hiding places onstage and more. The opera it precedes is a joyous farce concerning a single day in the life of three servants juxtaposed with that of members of the aristocracy. The featured solo piece of the evening, Anton Rubinstein’s “Cello Concerto No. 2,”is divided into three movements (sections). The first is serious and expressive, and the second delicate and lyrical. After an extended virtuoso passage, the third movement is a bright rondo inspired by a Russian folk song. The orchestra is privileged to welcome a guest soloist from the New York Metropolitan Opera Orchestra, cellist Samuel Magill. Sam has been described as a “very fine cellist” in New York City Concert Review, “his technique is solid and disciplined, tone warm, sonorous and variable, his projection direct and immediate.” He was trained at the Peabody Institute and Shepherd School of Music, has performed with the Houston and Pittsburgh symphonies, and served as principal cellist in the New York Symphonic Ensemble where he toured and performed as a soloist throughout Japan. After a brief intermission, the orchestra will enter Mahler’s “Symphony No. 1, Titan,” which has been described by the composer as “the journey of a strong heroic man, his life sufferings, his battles and defeat at the hands of fate.” In the first movement, the listener can hear the sounds of nature-bird calls and a rolling melody depicting a walk in a meadow. The second movement, a peasant dance replete with stomping and yodeling, is followed by the third movement, a rare funeral march based on “Frere Jacques.” The finale begins with a crash of cymbals and discord, a lightning flash leading up to an ultimately exhilarating conclusion where the horn players stand up in a final triumphant fanfare. In addition to selecting this program, Conductor Anthony LaGruth will offer additional insight to the pieces he has chosen, making this program friendly regardless of your appreciation of classical music. For further information on the performance or the orchestra, please visit www.lsonj.org or call (973)980-1809. NJJS 50th Annual Pee Wee Russell Memorial Stomp! Hear Sarod master Amjad Ali Khan with the NJSO!